Thank you Disney, for saving me from planning a ballet birthday party for girls plus boys in my backyard. Your release of the mega-hit Frozen was just in the nick of time, allowing me to keep the party far away from my not yet unpacked home full that’s choking me with crystal pieces that I am beginning to think will forever haunt my dining room table. But boo on you Disney for not pumping out enough of your typically prolific licensed merchandise. You really made it difficult for Mom’s like me, to pull together a Frozen birthday party. ballet party, we made it work. (Boys, you should thank me…) With the backdrop of ice skating at the Dr Pepper StarsCenter, the Princess Cupcake’s Frozen Birthday party was categorically a success. However, I will take credit for the major #momfail by forgetting Olaf and Sven for the table, as well as batteries for the snowflake lights. Three weeks later, I’m still mad at myself for leaving those at home! The rest however, turned out nice. It’s always tough to get a rented room decorated and ready in the small window of time that you have for a kids party, but I think we managed to do okay, although I also regret not configuring a fast backdrop behind the party table. Sigh. And because I feel your pain as it’s still tough to find Frozen merchandise, I’ve included links to where I purchased all of our party supplies in case you’re trying to put your own Frozen party together. The adorable Frozen invitations on Etsy from ColorfulPaperPrints. And since Elsa costumes were nowhere to be found, this shirt was a fantastic substitute — especially considering a dress would have been impractical while ice skating. It came from KrysiasCorner on Etsy. She was so awesome, emailing me while she was on vacation and still getting it to me in time! And because the Princess Cupcake doesn’t leave the house without a special headband, I got this to match from Julia’s Clips on Etsy. And a close-up of the top. You can’t see it in the photos very well, but the top had marshmallow fondant stamped with snowflakes and had sparking glitter on it. The aqua jewels were edible candy, as was the rock candy sprinkled on top as well.Cake Sources: Elsa and Olaf came from a Frozen toy purchased at Target, the rainbow rhinestone spray behind them is from Michaels wedding section, the rock candy is from Party City, the silver candles, snowflake embosser, and edible glitter are from a local cake supply store who shall remain nameless thanks so their ridiculous return policy, the dark blue glitter candle from Tom Thumb grocery store, and the candy jewels are from this shop called Pocket Full of Sweets on Etsy. The recipe for the buttercream frosting is here. I also made cupcakes… The “snowflake” sparkle picks on top were purchased at Hobby Lobby. I couldn’t resist a big pile of Sno balls on the table too. They were a hit with the parents who were old enough to remember what they were! To wash all that sugar down, we had plenty of bottles of Melted Snowman. You can get the download for this on Etsy here. The favor bags were a little bit different for boys and for girls. Each contained Frozen stickers and rock candy from Party City, custom wrapper chocolates, a beautiful snowflake lollipop. The girls favors also had a bottle cap Elsa or Anna necklace and a rubber snowflake charm bracelet, the boys also had a Sven or Olaf bottle cap keychain and snowflake kazoo. Inside were large and small marshmallows, pretzel sticks, chocolate chips and half of an orange reeses pieces. Since we had to haul in all of our decorations, there weren’t that many. The full size stand-up of Elsa was a huge hit though. I purchased Elsa from Oriental Trading. The balloons were from our local grocery store, except the large one I ordered off Ebay. It was two sided, one had Elsa, the other Anna. Word of advice, order two. I did, and one either popped or had a hole in it according to the grocery store that made our balloon bouquets. I was really glad to have a back-up! The centerpieces are below, although they are not shown complete. There were character picks in them as well — thanks to last minute help from @vintagejustice — and the Princess Cupcake dismantled them on the ride home so they could be puppets. The centerpieces are aqua polka dotted buckets from Michaels with snowflake Joleen’s stickers on them and some floral styrofoam inside. The tissue poms were in the wedding department at Michaels and came as a kit, the sticks were in the wood section and I covered them with aqua wash tape. The “6” paper is also from Michaels and was die cut with the Silhouette Cameo. Table covers were from Oriental Trading, the plates and napkins are from Party City but you can also get them from OT. The white sparkle deco mesh is from MardiGras Outlet. The clear and aqua “ice diamonds” (a huge hit with the girls) were also from Michel’s dollar section and Oriental Trading. The set of three silver glitter trees (seen in the cake photos above) are also from Oriental Trading. 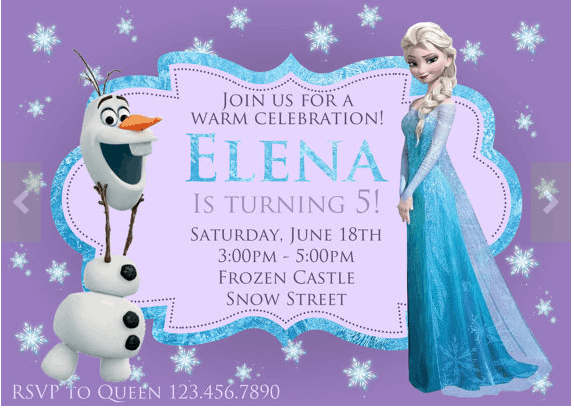 I am doing a frozen birthday party for my daughter. Can I borrow some of your decorations? I can pay you? Hi Sammy, thanks for the request. Unfortunately, I don’t have any of ours left.